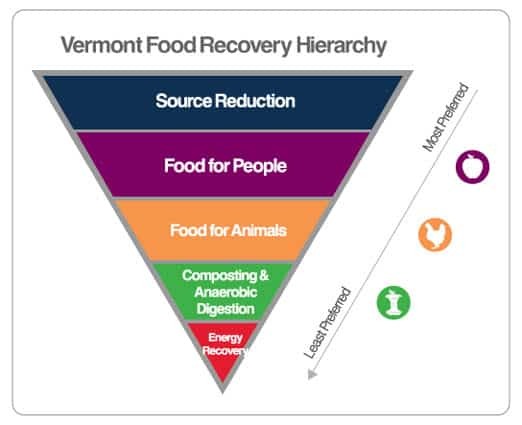 Rather than sitting useless in the landfill (and creating methane gas that pollutes the atmosphere), the Department of Environmental Conservation (DEC) encourages Vermont businesses to exercise creative ways to deal with food scraps, other than composting them or putting them in the landfill. All businesses must separate their food scraps from trash by July 1, 2020, and some before then. Even when Act 148 Universal Recycling Law bans food waste from the landfill, composting should be a last resort for food that is still edible. The DEC has produced a chart and strategies that show the order of steps in which leftovers should be managed. These options will also exempt your business from the costs of hauling the food waste to a certified facility. In Rutland County, there are no certified compost or anaerobic digester facilities, though some are in the process of becoming certified. Once that happens, businesses with the most food waste will be notified if there is capacity to process their food scraps, and that they must begin separating food scraps from the trash to comply with the law. July 1, 2016: businesses producing 26 tons or more of food waste annually (½ ton per week) must send it to certified composting facilities within a 20-mile radius. A business outreach coordinator will be in touch with most restaurants by that date, but if you would like to be proactive with your business, feel free to reach out before then. July 1, 2017: all trash and recycling pick-up services (haulers and transfer stations) must offer to also pick up food scraps for residents and businesses. All restaurants, grocery outlets, and other institutions producing food waste will have to begin separating food scraps by then to comply with the law. Contact your hauler to find out when they will offer this service. For more information about the Act 148: Universal Recycling law, visit the DEC’s website at dec.vermont.gov/waste-management/solid/universal-recycling. For more resources on managing food scraps, contact the Rutland County Solid Waste District office through the website www.rcswd.com, or by phone at 802-775-7209. For businesses in Solid Waste Alliance Communities management, visit www.rutlandcountyswac.org, or call 802-342-5701. Carl Diethelm is an intern for Rutland County Solid Waste.